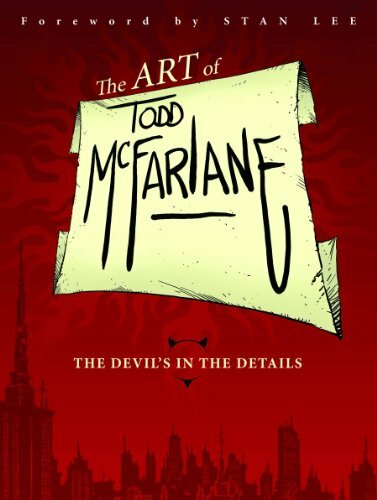 The Art of Todd McFarlane is a visual autobiography of the comic artist, master himself. It's quite a book to behold. It's a seriously inspiring book. You'll learn about the effort he put into drawing from his schooling days, to the getting his first job and then creating companies like Image Comics and McFarlane Toys. Besides that he has also included the many side projects he's involved in, such as creating music videos, concepts for animation and movie, video games and more. This guy sent out 700 submission letters to comic editors and received hundreds of rejection letters, and collected all the critiques to improve himself. And he actually counted the number of submissions sent?! That's determination, and the quality of his work shows. This guy is the accumulation of talent plus hard work. The artworks showcased are amazing. Very well reproduced, printed big. You'll see his early works, in pencils, ink and colours. The accompanying commentary provides insightful background to the work, and his career progression. He has worked for Marvel, DC Comics, so those works are included as well, as his many Spawn comic art. You'll read a lot about what goes on behind creating comic art. This book is available in hardcover and paperback. At 400 pages thick, I'll recommend getting the hardcover but I've yet to see the binding on the paperback. The paperback is much better and may be a better bargain for the price though. McFarlane sent out over 700 submissions and kept track of all the critiques he received. Side projects such as music videos.